It’s a fine wine to have after weekend sporting events or a day of working outdoors, raking leaves, stacking wood or cleaning up the garden, chores to prepare for the advent of winter. 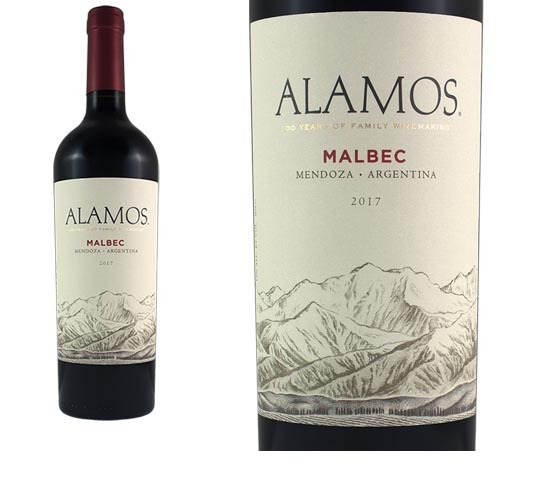 Its jammy flavors of dark cherry and blackberry accented by subtle hints of brown spice and vanilla make Alamos malbec an excellent match with grilled meats or chili or good for sipping while watching a beautiful fall sunset or sitting around the fire on a rainy night. I had my first taste of malbec in the late 1990s. My wife, Sandy, and I were having lunch with friends at an Argentinian restaurant in Santa Barbara, sitting outdoors on a warm, clear Californian fall day, on a hill overlooking the city below and the harbor in the distance. The setting was remarkable and a good place to try a wine I’d never had before. We liked the wine. As I remember, the tannins were young and the finish a bit rough, but the flavors were intense and the price was cheap. I wanted to buy more, but apparently the only places to find it then were Argentine restaurants. There weren’t a lot of them outside of Santa Barbara, and I didn’t live in California. A few years after that visit, Argentine malbec exploded on the U.S. market, and the wine became the darling of red wine drinkers across the land. I even knew some people who couldn’t remember the name who were drinking it and raving about it. In those early years, there were excellent high-end malbecs, but the ones in my price range, including Alamos, I didn’t think were that great, at least not good enough to become my favorite red. Alamos is produced by the Catena family, who have been making wine in Argentina for more than 116 years. In 1898, Nicola Catena left famine-stricken Italy and relocated in the Mendoza highlands. He opened the winery four years later and established the family name as a maker of fine malbec, at least in Argentina, according to a 2017 article in the Royal Gazette, a Bermuda newspaper. In 2018, his son Nicolas and granddaughter Laura, a San Francisco emergency room doctor, are running the business, and they have transformed the face of Argentine wine. Nicolas, a well-traveled academic economist, and some consultants figured out almost 40 years ago that malbec wines produced from grapes grown at higher elevations — where there’s lots of sun, snowmelt for water and cooler temperatures — had more complex flavors. Those wines were far superior to the wines from lower vineyards, which were thin and better suited for rose and summer drinking, an article in this month’s Decanter magazine says. By 1995, Nicolas’ Bodega Catena Zapata wines were pretty good, but outside of Argentina, they had little notice. That’s when Laura Catena became involved, she told Wine-Searcher in a July interview. Laura Catena had finished her residency that year, and Catena Zapata was invited to showcase its wines at the New York Wine Experience. No one from the winery who spoke English could attend, so she was drafted. “Nobody came to taste our wines. That’s when I realized that elevating Argentine wine to a higher level was a lot harder than we thought,” said Laura Catena, who is a graduate of Harvard and Stanford medical school. She said she decided that if she didn’t help her father, he and Argentina weren’t going to make it in the wine world. She started working part time in the San Francisco emergency room, took over as the head of viticulture and science and U.S. sales for the winery and founded the Catena Institute to assist Argentine producers with the science of growing malbec. In addition to her other duties, she’s a soccer mom and the author of two books. Laura Catena believes in helping out the winery’s workers, including women, whom she has placed in positions of leadership. One of those women is Lucia Vaieretti, who is the very talented head winemaker at Alamos. She uses a blend of malbec grapes grown at elevations from 3,000 to 6,000 feet above sea level to make the Alamos malbec. The grapes come from estate vineyards and from vineyards run by local managed growers, the tasting notes say. Vaieretti blends the wine made from the malbec grapes with small portions of Syrah and Bonarda wines before aging the finished blend in French and American oak barrels. The result is an inky-colored wine with concentrated dark fruit flavors, a medium structure with soft tannins and a smooth finish. The Alamos malbec of 2017 is a far cry from the wine I had in the 1990s. It’s a wonderful wine for fall (and winter) and a terrific value that should cost a lot more, although I bought it on sale for $9.99.